After a convincing 7-3 victory yesterday afternoon against Houston, the Phillies solidified a three game sweep of the Astros. The Phillies are currently one of four teams who took all three games in their opening series; Texas, Baltimore and Cincinnati being the others. They outscored Houston 21-11 in the series. Although we can all agree that the Astros are an inferior opponent, there were a lot of positives to take away from the sweep. Roy Halladay pitched an impressive six innings, but once again got no run support as he left the game down 1-0. J.C. Romero and David Herndon then came on in the seventh and allowed three more runs as the Astros took a 4-0 advantage. The Phillies entered the bottom of the ninth down 4-2 while accumulating just four hits in the first eight innings. Then, in typical Phillies fashion, the bats woke up when they were needed the most. Six hits, six singles, and the Phillies walked off with a 5-4 victory when John Mayberry Jr. singled on a sharp line drive over the head of center fielder Michael Bourn. Jimmy Rollins, Ryan Howard, Ben Francisco, Carlos Ruiz, Wilson Valdez and John Mayberry Jr. all recorded hits. Raul Ibanez was the only batter to record an out in the ninth. With Chase Utley still out for an unspecified amount of time, Jimmy Rollins and Ryan Howard have showed outstanding leadership in his absence. Rollins has filled in the vacated three hole very well thus far. He’s hitting .500, with all of his hits being singles. He’s reached base on 8-of-14 plate appearances so far. It was Rollins who lead the charge in the Phillies Opening Day 5-4 win. He lead off with a single, stole third, and was the first out of the dugout to celebrate with his teammates at home plate. Ryan Howard is known for being a notoriously slow starter. In the last three years, Howard accumulated just a .241 average in April. In three games thus far, he’s hitting the cover off the ball at a .538 clip (7-for-13). He has six RBI’s, including four yesterday. He’s standing closer to the plate, and while he’s still striking out, it seems like he’s seeing the ball much better. He’s laid off a couple of pitches off the outside part of the plate that he used to flail at. While it’s unrealistic to expect Jayson Werth type production from Francisco, it’s not unrealistic to expect a big season from him. He sprayed the ball around and hit .482 in the series. He’s pulling line drives, going the opposite field and went yard yesterday. In another tidbit, the Phillies scored 21 runs in the series against Houston, and hit just two home runs in the three games. Shane Victorino exited Game Two of the series with a calf injury, and was replaced by Michael Martinez in the lineup yesterday. Victorino did pinch hit, hit a RBI single, and took Martinez’ place in center. He made an amazing play on a sure Michael Bourn gapper in left-center field. With the ball tailing away from him, Victorino took a perfect route, turned on the burners, and somehow made the catch. Roy Halladay, Cliff Lee and Roy Oswalt combined to pitch 19 innings, striking out 23 batters. 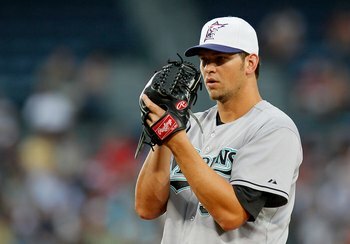 Halladay and Oswalt each fanned six in six innings, while Lee struck out 11 in seven innings. All three showed great command with their fastballs and secondary pitches. Lee and Oswalt each picked up a win. The relief pitching was a question mark heading into the year, but besides David Herndon and J.C. Romero’s shaky outings in Game One, the relief has been fine. Herndon and Romero allowed three earned runs in the seventh inning. Since then, the relief combined to pitch seven innings with Kyle Kendrick the only reliever to allow an earned run.